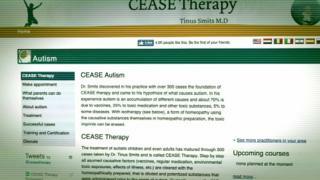 Therapists claim they can cure autism by removing these ‘harmful’ substances with homeopathic remedies and dietary supplements. Prof Nicola Martin, from London South Bank University, advised the Westminster Commission on autism and said Cease therapy was “based on no scientific foundation whatsoever”. “It talks about curing autism; autism is not a disease and not something which needs to be cured. “As an autistic adult, it disgusts me that these charlatans are taking advantage of parents,” she said. The ASA’s investigation found that 150 Cease therapists breached advertising guidelines that adverts must not falsely claim a product is able to cure an illness or dysfunction. The ASA’s chief executive, Guy Parker, told Radio 4’s You and Yours that they were concerned about misleading and potentially harmful claims on therapists’ websites. “We sent out enforcement notices to 150 Cease therapists operating in the UK. We have set out very clearly that they must not make either direct or implied claims in their ads including on their own websites that their therapy can either treat or cure autism. The National Autistic Society said it was pleased that the ASA is taking action against what it called “the bogus claims by people pedalling Cease therapy”.